Offering alternative miniature choices that parallel the larger Pop! line, 2016 Funko Fallout 4 Mystery Minis also include many companion choices from the post-apocalyptic Commonwealth. Developed and published by Bethesda Game Studios and Bethesda Softworks, respectively, Fallout 4 allows gamers to play in first- and third-person perspectives, with the freedom to move anywhere on the map. Throughout the game, players can design and build weapons, buildings, and settlements. Gamers play as Sole Survivor and can select companions, including Preston Garvey, Piper, Strong, and MacCready, to help in scavenging and to fight against the many creatures in the year 2287. 2016 Funko Fallout 4 Mystery Minis are a true mystery as they are issued in a blind-box format, by the case. Meaning, every miniature box is packaged the same to keep the element of surprise. However, there appear to be only 14 minis to collect as no announcement for any exclusives have been released as of yet, which means there is a greater chance to find and collect the entire set more easily. But, given that only 12 figures come in case, collectors will need more than one case to make the full lineup. The specific odds are not currently known for the 2016 Funko Fallout 4 Mystery Minis but will be updated as details emerge. Each figure is approximately 2 1/2" tall. There was also an earlier release for the franchise with Funko Fallout Mystery Minis. 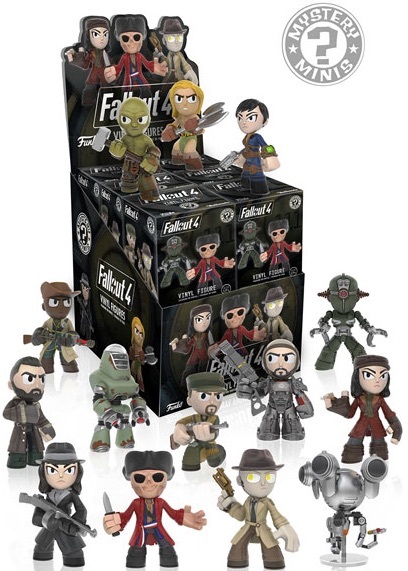 Additional Fallout mini figures were included as part of the Bethesda Mystery Minis set. Funko Fallout 4 Mystery Mini Sealed Blind Boxes - TWO SEALED BOXES! I’m hoping you may be able to help me out, since you have written this article and may know a little more. I am trying to come up with a checklist of all the Fallout 4 Mystery Minis that are out there, so I can work on completing this collection. I’m a huge Fallout fan, and probably have a lot of OCD, to be honest. Your list is great. However, I notice that its only complete from the “general” list. I’m looking for an exhaustive list with variants and exclusives. I’m hoping that if you currently don’t have that list, that perhaps in your position you’d have someone to contact that may be able to help. I’ve seen on eBay some variants and some of the exclusive ones, but I’m curious as to how many are out there. I’ve seen pics of the vault dweller with 10mm, laser rifle and others. Same with the Power Armor, and same with Cogsworth. I’ve seen him in a different paint as Curie. I’ve seen a synth version of Curie, even. So I’m curious if there is a way to get an exhaustive list of official Funko released Fallout 4 characters from all the different releases and store exclusives, so I don’t get duped in buying someones homebrew version (which is still cool, but I’d make my own if so inclined). Anyhow, thanks for your time.